For press information contact Cecily.Carbone@tate.org.uk or Jean.Tang@tate.org.uk or call +44(0)020 7887 8730 / 8731. High resolution press images can be downloaded from Tate's Dropbox. Don McCullin will discuss his remarkable career with Lionel Barber, editor of the Financial Times and Chair of Tate. There will also be a chance for audience questions and contributions. This day-long series of discussions and activities explores the complex ethical questions related to photography and other forms of contemporary image-making. The event includes a visit to the exhibition Don McCullin, analysis of leading theorists, and presentations by guest speakers. Join guide Deepy Chana for a British Sign Language tour of the exhibition. Blind and partially sighted visitors are invited to join an Audio Described tour of the exhibition. Join curator Aicha Mehrez for a talk about the exhibition followed by private view. A tour of the exhibition led by Sam McGuire (Interpretation) & Christopher Griffin (Research) focusing on the relationship between Don McCullin’s photos and their accompanying texts. 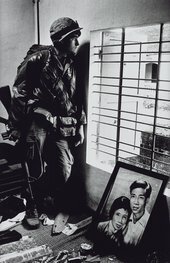 Join art historian Mignon Nixon in conversation with artists Sung Tieu and Jacqueline Hoang Nguyen as they discuss how notions of Vietnam been shaped by images of conflict.